The azaleas are really starting to pop out with enough color now to distract us from all the frost damaged flowers and foliage. They are a sure sign spring is on our heels. Every February we start out with a few blooms and then each day the color increases into explosions of color that brighten up so many gardens down here in the south. I was sure ya'll would want to see the start of this happening ... with more flowers sure to come. Meeting Kylee from Our Little Acre (in Ohio) was so much ... like finding a long lost friend. It was as if we had already known each other right from the start. I guess that is the one of the beauties of blogging. 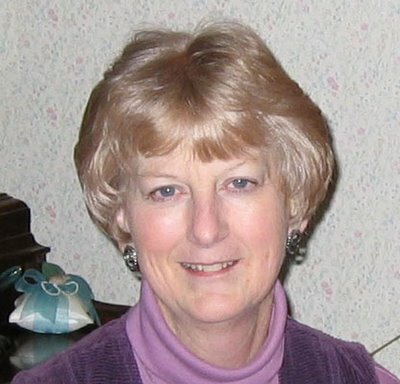 We really do make new friends virtually and then the added treasure to actually meet face to face is so natural. We chatted it up for hours and wished we had planned more time together... next time we will. Truth be told, I haven't hardly come up for breath since my last post when I let you all know I was expecting visitors. Today I am on my way out the door again but I wanted to give you some quick updates. You can read more about our visit from Kylee's perspective here. She is having lots more fun on her Florida vacation, too. So hang around her blog a while (after you finish reading this of course) and check out her beach trip and all the pretty flowers growing just south of here. What's the Latest with the Peacocks? So many of you have asked about the peacock situation. I snapped this photo as my sister and I were on our way out the door yesterday. This guy is looking to cross the street from my neighbor's over to my garden. I put Mr. Meems on 'shoo-away' duty yesterday while I was gone. My phone has been ringing off the hook in response to the ad I ran for "free peacocks". No one has really stepped up to the plate to come trap them. I've even spoken to a couple of "licensed trappers" who were interested -- only they haven't followed up to actually come get started. It isn't as if you set out traps and all six peacocks will just come running. From what I've gathered it is quite a process and could take several attempts and many trips back and forth for the trapper. Honestly I have been SO busy I haven't had time to do my own follow up like I should. When my sister heads back home I'll take the time to make sure I've exhausted all the possiblities with folks who have shown interest. Marmee and I have had the best time catching up. We aren't getting much sleep but we are having a blast. Our primary goal on this trip was to spend as much glorious time at the beach as possible. So off we went yesterday! Only it was one of those VERY RARE non-sunny days in Florida. Not only was the sun not shining but it was foggy. All day. At the beach, people! Do you know how strange that is? I don't think I recall EVER seeing it last all day long in my lifetime. A cold front had moved through ... but very slowly. It caused the fog to set in early in the day and it didn't pass through completely until last night. Not to worry. 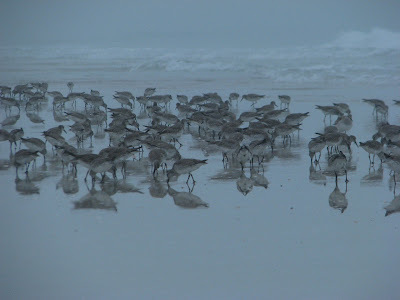 We walked on the beach and breathed in the fresh salty air, felt the sugary white sand in our toes, listened to the waves and chatter of birds anyway. The beach is glorious no matter what! 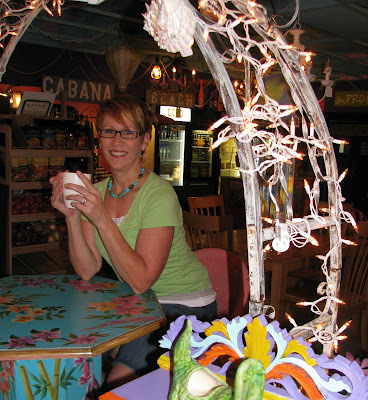 I took her to one of my favorite little beach shops on Anna Maria Island. It was relaxing and wonderful to take our time just hanging out. Marmee wrote more about it on her blog last night. That cold front did cool us down to 50's at night and 70's in the day. PERFECT FOR THE REST OF THE WEEK! We are off to the beach again today! The world is already warm with plenty of golden liquid from above! What a fun post. Lots of different topics. I had already read about the cafe/shop and the foggy beach on Marmee's post;) I will think of the two of you walking on a sunny beach today and be green with envy. Have a wonderful time. I have a few azalea blooms too. That peacock is so pretty. Sounds as if you and your sister are having a great time. I read about the beach trip on her blog. Have fun today!! 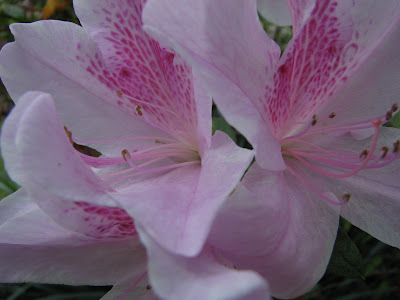 Not five minutes ago I posted a couple of azalea photos myself. 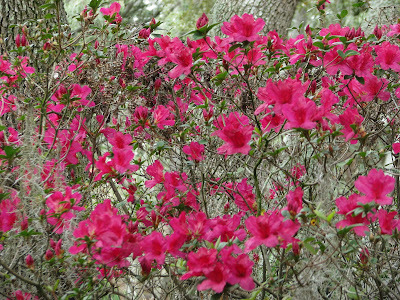 What a lovely gift God gives us in the beautiful colors of azaleas - particularly this year, as they stand out in a sea of golden frost and freeze-bitten grasses. Years ago - and I do mean years - probably around 1972 - Louis and I went to the very same beach with another couple and it was foggy the entire day. I've never forgotten it, nor had that happen since. Emily and I are planning a beach day next week. We are going to Punta Gorda for an event with Rep. Tom Rooney, and afterwards we are hoping to drive on over to Boca Grande - one of our other favorite beaches. How I envy you your trips to the beach this time of year -- it's late April/May before we even consider venturing to the sand, and even then, it's with hoodies in place! :) I hope you resolve your peacock issues. Meems, your garden is lovely- have to say the peacock makes a stunning display! You and Kylee look like you could be related! Hope everything slows down a bit for you and I look forward to all the updates! Looks like you are having a lot of fun with your sister and that is as it should be. You know I'm not a beach person but a cloudy day at the beach would be the best kind for me. Glad you're having a great time with all your visitors ... except those peacocks! Your azaleas look fabulous. I think we all are wearing the same glasses! Love the style! :-) So glad you girls got a chance to meet in person. I know what you mean about our virtual world gardening friends when I've met a few. Great time! I'm envious of your azaleas, but mine will be along in April... seems like a long time, doesn't it? Peacocks, ’08 hatch, some breeders, Indian blue, black shoulders, whites, purples, cameos, Java greens, $40 up. First your header photo is perfect for the holiday! I loved reading about your visitors...Isn't it the most fun meeting bloggers we've known online. I know just how you feel...when I met Layanee on a trip to RI we were very comfortable....immediatly. Frances and I are dear friends from our meeting at Spring Fling. Have a wonderful time with Marmee. The azaleas are gorgeous and even the pesky peacock looks beautiful. Hmm, you should have given the peacocks to Kylee! Glad you had fun with your visit. Oh my gosh you have been having just the most wonderful time with your visitors. Those peacocks are a nusiance. I hope the trappers come to your aid soon. Love the header shot. Happy Valentines Day. It looks like you are ready. I enjoyed all the updates. I can't imagine fog on the beach, but you still had the sounds of the waves to know where you were, I imagine. I am so longing to see the ocean again, but have other things I need to spend money on. I'm glad you and Marmee are having fun, and the weather is better today. Nice to see your azaleas. Ours will be out in April/May. They're always a beautiful sight. Meems!! 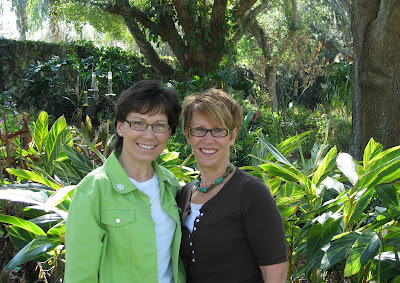 How delightful to have a blogger buddy come visit--know you showed her all the sweet spots--what a blast!! Awesome! Thanks for posting those beautiful flowers and the peacock. Just what I need to brighten up a cold winter day. Sounds like you're busy but having fun. Your azaleas are beautiful. I love this time of year and our warmer temps are making them even more enjoyable. Have a great time at the beach. Meems -- what fun you and Kylee must have had. We felt the very same way about the Spring Fling last year. I'm so looking forward to Chicago this year. I'm so sorry about your lingering peacock problem -- but I must admit, I am enjoying the tales. And you'll be glad to know I used your shell ginger post instead of Google to learn about dividing mine. I have 2 huge ones and 7 big ones. I want to share them when I cut them back next week, but wanted to be sure I was doing it right, so thanks for the lesson! Just like a letter from home! All newsy and fun. Loved catching up with all that's been going on in your life. A foogy day at the beach sounds lovely to me-just walking and enjoying the ocean. But I would also fancy a warm sunny day there too. :) Have fun with Marmee. What a fun, newsy post Meems. You I love how your energy comes through as you're conveying all the memorable, fun stuff you're up to recently. Sounds like you've been having a wonderful. The azaleas are gorgeous, and I LOVE your beautiful, romantic Valentines Day header. it is so great to see all this in person. i am having a blast. thank you for all you have done so far. even shooing the peacocks was fun. I apologize to everyone for being so slack in commenting back lately. You guys are THE BEST to come here and follow along on whatever journey(s) my little life takes me. Things have been a little bit non-stop these days which is way fun too. Only it makes for less blogging time. SOOOOOOOOOOO thanks for coming along with Marmee and I on our beach trips and for stopping by and leaving your comments. I READ EVERYONE and they EACH MATTER to me very much. I'll get around to your blogs eventually as well. Blessings to each and every one of you! I was so pleased that you had fun with Kylee (and envious that you got to meet!) Hopefully the peacock problem will get solved soon. Nice blog, really enjoyed the azalea photos. Your carrot photos makes me a tad bit jealous. We'll see what ours in NC look like this year. Lots going on at Hoe and Shovel! You've had wonderful visitors and lots of fun..lucky you! 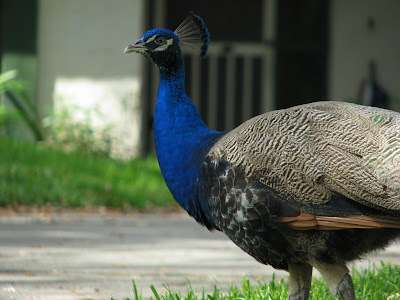 Too bad those beautiful peacocks are such a pest. I hope that gets resolved soon. The azaleas are superb! Thanks for the peek. A day at the beach (even foggy) would be so welcome. Ah, to smell that ocean air! Enjoy! How wonderful for you two to meet! It is always a pleasure to meet a fellow garden lover isn't it? I'll bet you had loads to discuss! Wish I were in FL right now.